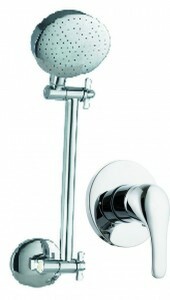 This kit as supplied and fitted gives you a single lever shower mixer and universal shower rose and arm. Both items are in chrome. The hot and cold pipe work is fitted to the fittings and ends just below the tap fitting in a 1/2″ BSP male threaded fittings. This grate fits into the recessed area of the shower cubicle floor. Unit supplied in white. Unit not fitted but supplied loose.